Just looking at the plumbing (comes preassembled as shown above) above may seem rather complicated but is really very simple. We have made it easy to install. You have just basic connections to make. Water flow is non restrictive. The water enters the lower connection in a straight line. Enters the tank and moves up through the media balls and back out in a straight line. This makes the unit non restrictive. The valves and turns are only used during backwash. 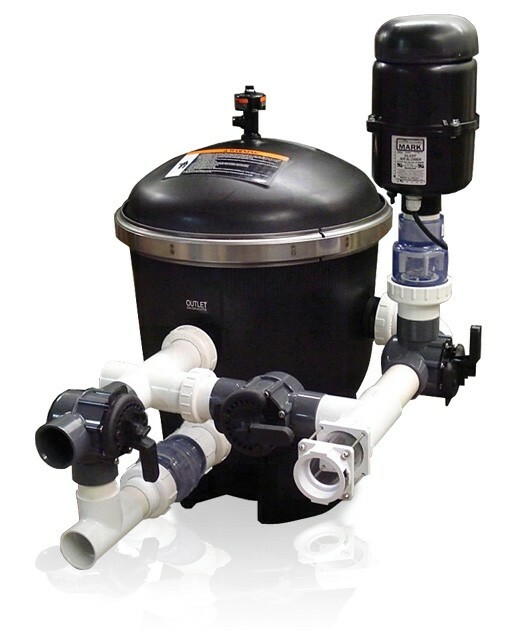 This allows the unit to be used with low amperage koi pond type pumps. See the illustration below for more explanation of the plumbing. Comes complete with all plumbing shown plus an extra swing check valve and 3 way valve. All you have to add is regular pvc parts and fittings to fit your application.